← Future Home of Royal Rosamond Press? The name Rosamond will forever be associated with the search for the person who authored Shakespeare’s work. After taking a DNA test for Ancestry.com, it is proven one of my great grandmothers is Abigail Shakespeare Webb. One of my grandfathers is Lewis Clifford who is related to Joan Rosamond Clifford, who Samuel Daniel wrote a poem about and dedicated to Mary Sydney Countess of Pembroke who is kin to the Dudley family, who I suspect were instructed by Queen Elizabeth to create a English Literary Society to counter Charle’s Quint to make the world speak Spanish. Elizabeth was the first Protestant Queen. Charles was the King of the Roman Catholics. This is entirely my theory. I suspect this was the idea of John Dee. Wilton House became the home of Bards and Muses who were Agents of the English Language for Her Royal Majesty. It is here that many of the candidates for authorship of Shakespeare’s work, met, and work, and conspired, to………….overcome the world with the English Language. The are eighty-six million English Speakers in India. I am kin to Ian Flaming via Elizabeth Rosemond Taylor, who married several famous actors that my DNA test has connected to Abigail Shakespeare. I am in need of a huge grant! I need to move Royal Rosamond Press to a safe spot. I am forced to publish the core of long study due to the threats on my life. For years I have owned the fear that the closer I got to the truth, the sooner I will arrive at my Ambush. I see my death at the hands of a five hundred pound superstitious low-life moron, who will sneak up behind me and hit me with the gnarly club. Lying unconscious on the ground, she will then sit on my face, like an egg, and smother me to death. And, so it goes. I am the thrower of the dart that Ben Johnson speaks of. I suspect Mary and her brother compiled the bulk of the work attributed to Shakespeare because of their knowledge of the Bible, and their Psalms. But, it was Mary who applied the finishing touches. She appears to have been a Genius. Like her mother, she was an Alchemist. John Dee is lurking about. Mary was married to William Herbert who founded ‘The Pembroke Men’ an acting troupe that toured at the time of Shakespeare’s troupe. Why didn’t the merge? I believe they were born of the same source at Wilton House. I see Mary as a super Editor with a photographic memory like Rena. She was a human dictionary and Wikipedia. But most importantly, she introduced the Feminine Touch, kept it alive in these plays. Samuel Daniel is auditioning, he dedicating poems about women to Mary. He has to be aware the Literary Consortium that may be producing plays to fund the Wilton House Society that has close ties to English Royalty. I want to found a Shakespeare Wilton House in Boston. I seem to have a mind like Mary Sydney’s. Other scholars can come work along side the Bard’s DNA. Shakespeare’s authorship was first questioned in the middle of the 19th century, when adulation of Shakespeare as the greatest writer of all time had become widespread. Shakespeare’s biography, particularly his humble origins and obscure life, seemed incompatible with his poetic eminence and his reputation for genius, arousing suspicion that Shakespeare might not have written the works attributed to him. The controversy has since spawned a vast body of literature, and more than 80 authorship candidates have been proposed, the most popular being Sir Francis Bacon; Edward de Vere, 17th Earl of Oxford; Christopher Marlowe; and William Stanley, 6th Earl of Derby. The Earl of Pembroke’s Men was an Elizabethan era playing company, or troupe of actors, in English Renaissance theatre. They functioned under the patronage of Henry Herbert, 2nd Earl of Pembroke. Early and equivocal mentions of a Pembroke’s company reach as far back as 1575; but the company is known for certain to have been in existence in 1592. In that year, a share in the company was valued at £80 (more than William Shakespeare would pay for New Place in Stratford-upon-Avon five years later). Mary Herbert, Countess of Pembroke (née Sidney; 27 October 1561 – 25 September 1621) was one of the first English women to achieve a major reputation for her poetry and literary patronage. By the age of 39, she was listed with her brother Philip Sidney, Edmund Spenser, and William Shakespeare, as one of the notable authors of her time in the verse miscellany by John Bodenham, Belvedere. The influence of her Antonius is widely recognized: it stimulated a revived interest in the soliloquy based on classical models, and was a likely source (among others) for both the 1594 closet drama Cleopatra by Samuel Daniel and Shakespeare’s Antony and Cleopatra (1607). Sidney was also known for her translation of Petrarch‘s “Triumph of Death” (from Triumphs), but it is her lyric translation of the Psalms that has secured her poetic reputation. Lady Anne Clifford is kin to Rosamond Clifford. These are two of my favorite characters in history. 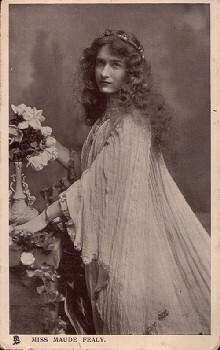 Lady Clifford was a patron of the arts and literature and held a salon. Her tutor was Samuel Daniel who authored ‘The Complaint of Rosamond’. Lady Anne took part in Masques that influenced Shakespeare. There are over a 150 plays, poems, songs, and novels written about Rosamond Clifford. I must count the number of paintings that bring back to life ‘The Rose and Muse of the World’.Jessie and Susan Benton held a salon in San Francisco and Paris. Many famous authors attended these salons. As an Art Historian I have spent thousands of hours putting together a enduring bouquet that will last forever, will never lose its fragrance. I am the Phantom of this Rosy Opera! This blog is my Masterpiece! Enjoy! Your destiny awaits you! I believe it is your fate to recite Samuel Daniel’s ‘Complaint of Fair Rosamond’ on a British stage. In researching the Rosamond family name I came to gaze upon a original copy of Daniel’s poem at the Knight Library. Another book said there are over 160 poems and stories written about Rosamond. I already had so much to do, then author a book on this historic person. In several blogs I express a desire to use you as a model for my portrait of King Henry’s paramour. It has come to light that Daniel’s sister, Rosa Daniel was the Muse for the English poet, Edmund Spenser, who may have changed the name Rosa, to, Roselinde. Edmund and Samuel were good friends. The question now, is, was Rosa the Muse for her brother? Daniel and Rosa had a gifted brother who was smitten by a Muse. Rena, if you read the post on my abusive father, then you understand we had the same father. The world wants to see us both emerge from the darkness we were born into, and turn that darkness into a banner of light others can follow. I suggest we do a collaboration. I can do the stage design and several large portraits. We can apply for a grant. Samuel also put to prose the history of the War of the Roses. There is a lot of interest in this rosy war at the moment due to the Game of Thrones. To see a woman come on stage and recite this history in old English (if you prefer) would be a work of art, especially when you look at Rosamond’s influence on the Plantagenets. You can literally take command of the Stage of History and revive the work of a contemporary of Shakespeare that most people never heard of. This offer is the end of my autobiography. I beg you to take up the gauntlet and do what your late husband and your children would want you to do. If you turn me down, then you can give your reason why. I am done with being the Scapegoat to women who are too wounded to face their real abuser and rise from the ashes of despair. You can make the end of my story – a true miracle! You are the author of the last chapter! Charles was born in 1500 as the eldest son of Philip the Handsome and Joanna of Castile in the Flemish city of Ghent, which was part of the Habsburg Netherlands. The culture and courtly life of the Burgundian Low Countries were an important influence in his early life. He was tutored by William de Croÿ (who would later become his first prime minister), and also by Adrian of Utrecht (later Pope Adrian VI). It is said that Charles spoke several vernacular languages: he was fluent in French and Dutch, later adding an acceptable Castilian Spanish (which Charles called the “divine language”) required by the Castilian Cortes Generales as a condition for becoming King of Castile. He also gained a decent command of German (in which he was not fluent prior to his election), though he never spoke it as well as French. He was first encouraged and, by his own account, taught in verse, by the Countess of Pembroke, whose honour he was never weary of proclaiming. He had entered her household as tutor to her son, Lord Herbert. His first known work, a translation of Paulus Jovius, to which some original matter is appended, was printed in 1585. 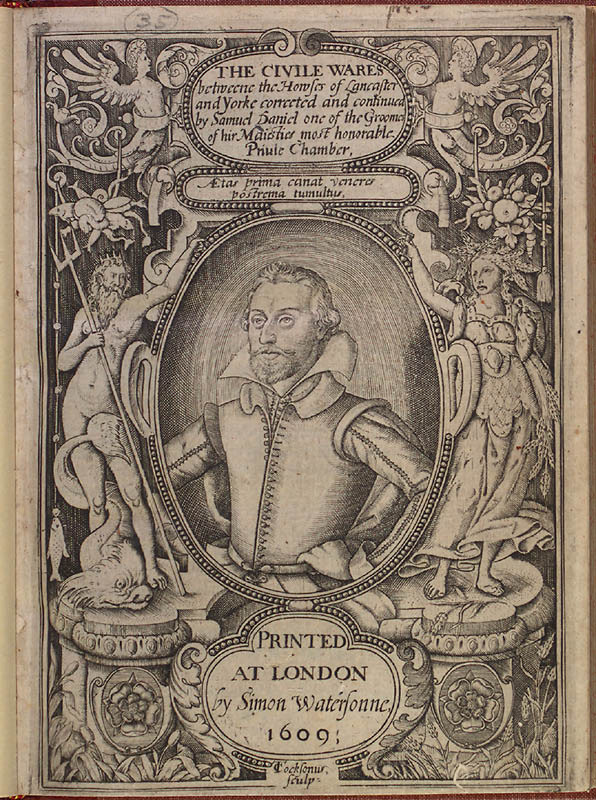 His first known volume of verse is dated 1592; it contains the cycle of sonnets addressed to “Delia” and a romance called The Complaint of Rosamond. Twenty-seven of the sonnets had already been printed at the end of Sir Philip Sidney‘s Astrophel and Stella without the author’s consent. 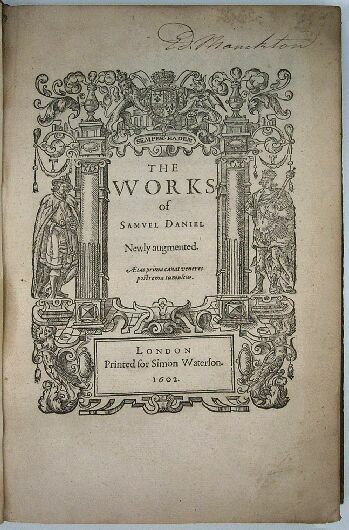 Several editions of Delia appeared in 1592, and they were very frequently reprinted during Daniel’s lifetime. Dedicated to “The Right Honourable the Lady Mary Countess of Pembroke”, we learn that Delia lived on the banks of the River Avon—not Shakespeare’s, but the one which flowed through “where Delia has her seat” at Wilton in Wiltshire—and that the sonnets to her were inspired by her memory when the poet was in Italy. To an edition of Delia and Rosamond, in 1594, was added the tragedy of Cleopatra, written in classical style, in alternately rhyming heroic verse, with choral interludes. 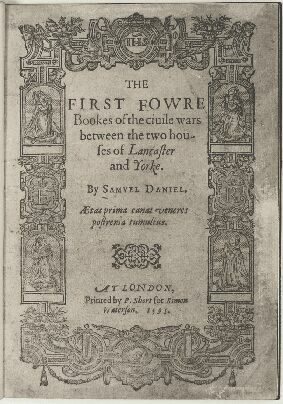 The First Four Books of the Civil Wars, a historical poem on the subject of the Wars of the Roses, in ottava rima, appeared in 1595. As far as is known, it was not until 1599 that there was published a volume entitled Poetical Essays, which contained, besides the “Civil Wars,” “Musophilus” and “A letter from Octavia to Marcus Antonius,” poems in Daniel’s finest and most mature manner. About this time he became tutor to Lady Anne Clifford, daughter of the Margaret Clifford, Countess of Cumberland. On the death of Edmund Spenser, in the same year, Daniel received the somewhat vague office of Poet Laureate, which he seems, however to have shortly resigned in favour of Ben Jonson. At about this time, and at the recommendation of his brother-in-law, Giovanni Florio, he was taken into favour at court and wrote a Panegyricke Congratulatorie in ottava rima which he offered to King James I of England at Burleigh Harrington in Rutland during James’ initial progression from Edinburgh to claim the throne in London. The Crollalanza theory seems to have been first set out in Santi Paladino‘s 1929 pamphlet Shakespeare sarebbe il pseudonimo di un poeta italiano (“Shakespeare would be the pen name of an Italian poet”). In the early versions Crollalanza was said to be from a Calvinist family in Valchiavenna or nearby Valtellina in Northern Italy. The literary scholars Dame Frances Yates and Keir Elam believe that Paladino initially confused the Elizabethan linguist John Florio with his Italian-born father Michelangelo Florio. However, according to Keir Elam, in the 1950s Paladino decided that Shakespeare was in fact Michelangelo Florio, the father of John Florio, and that the father and son collaborated on the plays, with John Florio improving his father’s English—making the Crollalanza theory, at this stage, a version of the John Florio authorship theory. Elam also remarks that “Italian, or perhaps Sicilian nationalism” gave rise to this theory. Mary Dudley was the eldest daughter among the 13 children of John Dudley, 1st Duke of Northumberland and his wife Jane Guildford. Mary Dudley was well-educated. Fluent in Italian, French, and Latin, she was interested in alchemy, romances, and writing poetry. Her copy of Edward Hall‘s Chronicles bears her annotations in French. She also became a friend, correspondent and frequent visitor of the scientist and magus John Dee. On 29 March 1551 Mary Dudley married Henry Sidney at Esher, Surrey. Possibly a love match, the ceremony was repeated in public on 17 May 1551 at her parents’ house Ely Place, London. Four months later Henry Sidney became Chief Gentleman of Edward VI‘s Privy Chamber; he was knighted by the young King on the day his father-in-law, who headed the government, was raised to the dukedom of Northumberland. Mary Sidney was born on 27 October 1561 at Tickenhill Palace in the parish of Bewdley in Worcestershire. She was one of the four daughters of Sir Henry Sidney by his wife Mary Dudley, a daughter of John Dudley, 1st Duke of Northumberland. Her brother was the poet Philip Sidney (1554–1586). As a child she spent much time at court, where her mother was a Gentlewoman of the Privy Chamber and a close confidante of Queen Elizabeth I. Like her brother Philip, she received a humanist education which included classical languages, French, Italian, music and needlework. Following the death of Mary’s youngest sister, Ambrosia, in 1575, the queen requested Mary to return to court to join the royal entourage. Philip Herbert, 4th Earl of Pembroke (born 1584), who succeeded his brother in 1630. These brothers are the “Incomparable Pair” to whom Shakespeare‘s First Folio is dedicated. The title page of Sidney’s The Tragedy of Antony, her interpretation of the story of Mark Antony and Cleopatra. Mary Sidney turned Wilton House into a “paradise for poets”, known as the “Wilton Circle” which included Spenser, Daniel, Michael Drayton, Ben Jonson and Sir John Davies, a salon-type literary group sustained by the Countess’s hospitality. John Aubrey wrote that “Wilton House was like a college, there were so many and ingenious persons. She was the greatest patroness of wit and learning of any lady in her time”. She received more dedications than any other woman of non-royal status. She was regarded as a muse by Daniel in his poem “Delia” (an anagram for ideal). Her brother, Philip Sidney, wrote much of his Arcadia in her presence, at Wilton House. He also likely began preparing his English lyric version of the Book of Psalms at Wilton as well. He had completed 43 of the 150 Psalms at the time of his death during a military campaign against the Spanish in the Netherlands in 1586. She finished his translation of the Psalms, composing Psalms 44–150 in a dazzling array of verse forms, using the 1560 Geneva Bible and commentaries by John Calvin and Theodore Beza. Hallett Smith has called the psalter a “School of English Versification”: of one hundred and seventy-one poems (Psalm 119 is a gathering of twenty-two separate poems), the verse psalter only replicates the formal structure of a poem, its rhyme scheme and meter, three times. A copy of the completed psalter was prepared for Queen Elizabeth I in 1599, in anticipation of a royal visit, but Elizabeth canceled her planned visit to Wilton. This work is usually referred to as “The Sidney Psalms” or “The Sidney-Pembroke Psalter” and is regarded as an important influence on the development of English religious lyric poetry in the late 16th and early 17th century. John Donne wrote a poem celebrating the verse psalter, and claiming that he could “scarce” call the English Church reformed until its psalter had been modeled after the poetic transcriptions of Philip Sidney and Mary Herbert. Mary was instrumental in having her brother’s An Apology for Poetry (or, Defence of Poesy) put into print, and she circulated the “Sidney-Pembroke Psalter” in manuscript at about the same time. The simultaneous circulation of the two works suggests a proximate relationship in their design: both the Defence and the psalter translation argued (in formally different ways) for the ethical recuperation of poetry as an instrument for moral instruction—and particularly for religious instruction. Mary also took on the task of editing and publishing her brother’s “Arcadia” which he claims to have written in her presence, as The Countesse of Pembroke’s Arcadia. By at least 1591, the Pembrokes were providing patronage to the Pembroke’s Men playing company, one of the early companies to perform the works of Shakespeare. Mary’s husband died in 1600 leaving her, as Aubrey reported, with less financial support than she might have expected (though views on its adequacy vary). By some accounts, King James I visited Wilton on his way to his coronation in 1603 and stayed again at Wilton following the coronation to avoid the plague. According to one account Shakespeare’s company “The King’s Men” performed at Wilton at this time. In addition to the arts, Mary had a range of interests. She had a chemistry laboratory at Wilton House, where she developed medicines and invisible ink. From 1609–15 Mary Sidney probably spent most of her time at Crosby Hall in the City of London (now relocated as a private residence to Chelsea, London). She traveled with her doctor, Sir Matthew Lister, to Spa on the Continent, where she relaxed by shooting pistols and playing cards. In 1615 she commenced the building of a grand hunting lodge with fine vistas, Houghton House in Bedfordshire, on an estate granted to her by King James I, which she completed in 1621, shortly before her death. It is said that the house, today a ruin, was the model for House Beautiful in John Bunyan‘s The Pilgrim’s Progress (1678). She died of smallpox on 25 September 1621, aged 59, at her townhouse in Aldersgate Street in the City of London, shortly after King James I had visited her at the newly completed Houghton House in Bedfordshire. After a grand funeral in St Paul’s Cathedral, her body was buried in Salisbury Cathedral, next to that of her late husband in the Herbert family vault, under the steps leading to the choir stalls, where survives her mural monument. 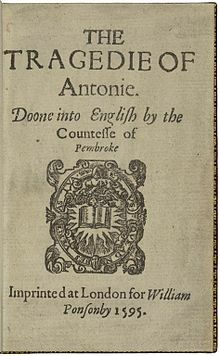 In addition to her closet drama Antonius, a translation of the French play Marc-Antoine (1578) by Robert Garnier, Mary is known to have translated two other works: A discourse of life and death by Philippe de Mornay, which was published with Antonius in 1592; and Petrarch’s The triumph of death, which circulated in manuscript. Her original poems include the pastoral, “A dialogue betweene two shepheards, Thenot and Piers, in praise of Astrea,” and the two dedicatory addresses, one to Elizabeth I and one to her brother Philip, contained in the Tixall manuscript copy of her verse psalter. An elegy for Philip, “The dolefull lay of Clorinda,” which was published in Colin Clouts come home againe (1595), has been attributed to both Spenser and to Mary Herbert, but Pamela Coren is probably right to attach the work to Spenser, and certainly right to assert that Mary’s poetic reputation does not suffer from the loss of the attribution. Although the psalms were not printed during in her lifetime, they had an extensive manuscript publication. There are 17 extant manuscripts today—a considerable number. A later engraving of Herbert shows her holding them. Her influence—through literary patronage, through publishing her brother’s works and through her own verse forms, dramas, and translations—can be assessed in a number of ways. Contemporary poets who commended Herbert’s verse psalms include Daniel, Davies, Donne, Drayton, Sir John Harington, Ben Jonson, Aemelia Lanyer, and Thomas Moffet. The importance and influence of the Psalter translation is evident in the devotional lyric poems of Barnabe Barnes, Nicholas Breton, Henry Constable, Francis Davison, Giles Fletcher, and Abraham Fraunce—and its influence upon the later religious poetry of Donne, George Herbert, Henry Vaughan, and John Milton has been critically recognized since Louis Martz placed it at the start of a developing tradition of seventeenth-century devotional lyric. There has been speculation that she wrote Shakespeare’s plays. Robin P. Williams presents a circumstantial case that Mary Sidney might have written the sonnets attributed to Shakespeare, seventeen of them urging her brother to marry, and most of the others to her lover Doctor Mathew Lister. Williams also sees the Lister relationship behind the play All’s Well That Ends Well. Williams acknowledges that there is no documented evidence for the case, but notes that the detailed knowledge in the plays of sailing, archery, falconry, alchemy, astronomy, cooking, medicine and travel correlate well with what we know of Mary Sidney’s life and interests. Mary Sidney was aunt to the poet Lady Mary Wroth (the daughter of her brother, Robert Sidney). Born in London, John Florio was of Anglo-Italian origin. He referred to himself as “an Englishman in Italiane”. John’s father, Michelangelo Florio, born in Tuscany, had been a Franciscan friar before converting to the Protestant faith. He got into trouble with the Inquisition in Italy, after preaching in Naples, Padua, and Venice. Seeking refuge in England during the reign of Edward VI, he was appointed pastor of the Italian Protestant congregation in London in 1550. He was also a member of the household of William Cecil. He was dismissed from both on a charge of immorality, but William Cecil later fully forgave him. Little is known of Florio’s mother; she may have been English. Michelangelo Florio then became Italian tutor to Lady Jane Grey and in the family of William Herbert, 1st Earl of Pembroke, father of Henry Herbert, 2nd Earl of Pembroke who would become the husband of Mary Sidney, sister of Philip Sidney. He dedicated a book to Henry Herbert and Jane Grey, his highest-ranking pupils: Regole de la lingua thoscana (Rules of the Tuscan language). Lady Jane Grey’s youth, faith, and death affected him deeply and later, in seclusion, in Soglio in Switzerland, he wrote a book about her life. It was only published in 1607 but written around 1561/1562. He describes her as a martyr and innocent “saint”. It is possible that he had witnessed some of the events surrounding her or had told her about the persecutions in Italy. Anthony à Wood says that the Florio family, which now included infant John Florio, left England on the accession of Queen Mary. In Strasburg, Florio met members of the aristocratic de Salis family of Bregaglia (Bergell), in the Alpine canton of the Grisons (in Italian-speaking Protestant Switzerland). Count de Salis offered Michelangelo the post of pastor at Soglio, which offered him the manse (now a restaurant) on the edge of a precipice, the post of local school teacher and a Reformed pulpit. Soglio was remote from the Inquisition and was situated near Chiavenna (north of Lake Como in Italy), a centre of Reformed preaching. John Florio grew up speaking Italian with his father (and possibly fluent English with his mother). His father would have taught him French and German. When he was seven, he was sent to live with and to be schooled in Tübingen in Germany by the Reformed Protestant theologian, Pier Paolo Vergerio, a native of Venetian Capodistria (who had also lived in Swiss Bregaglia) and later to attend university in Germany. John returned to England, possibly with his mother, in the reign of Queen Elizabeth, in the early 1570s, in possession of a formidable Christian Reformed and humanist education. John Florio considered the English uncouth and barbaric and set about teaching the Protestant aristocrats European manners, linguistic skills and polished expressions. This mission was in some ways similar to that of reformer Philip Sidney who sought to educate the English to write and to read the Scriptures in their own enriched language. Florio introduced the English to Italian proverbs. Florio was a friend of Giordano Bruno, while he worked as tutor and spy (for Elizabeth’s spymaster, Sir Francis Walsingham) in the home of the French Ambassador. Frances Yates relates the story of a lively dinner party at Whitehall Palace at which Florio translated to the assembled company, which included Sir Philip Sidney and Oxford professors, Bruno’s theories about the possibility of life on other planets. John Florio resided for a time at Oxford, and was appointed, about 1576, as tutor to the son of Richard Barnes, Bishop of Durham, then studying at Magdalen College. June and Paul Schlueter published an article in The Times Literary Supplement of 23 July 2010, in which they described a manuscript of newly discovered works by Mary Sidney Herbert. A month ago a friend of the Sinclair family replied to my post on Ian Sinclair, where I make the case that he and other members of the Sinclair Clan ganged up on me, and, banned, censored, shamed me, and tried to defame me and my study of my mother’s maiden name. ROSAMOND! He wanted me to remove my testimony, and – drop dead! There was much fanfare to the Sinclair DNA test, then came arguments over their bloodline that I could not take part in because I do not share one drop of their precious blood. What happened to Freedom of Religion – in Europe? How many Men of God fled the Isles to America? 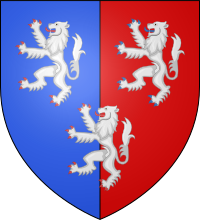 This exclusiveness may change with my discovery the Wilsons descend from the De Clifford family, and thus most of the Royalty of Europe. I just found this out – yesterday! In spite of all the people who did their damnedest to make me quit my research, I just made a stunning discovery 40 minutes ago. My blood-kin, Reverend John Wilson, is the subject of Hawthorne’s ‘The Scarlet Letter’. How timely with the appointment of Kavanaugh to the Supreme Court. I will now read this book. I have a vision of me reading exerts of it in a Senate Hearing. Here is the Trunk of our Democratic Tree! Jesus forgives the woman accused of Adultery which is still seen as INNOVATIVE! Welcome to the The New World! Ian Sinclair did not like me suggesting that my grandmother, Mary Magdalene Rosamond, was a player in the Rose Line Game, because, she is the only a human owner this name. Ian did not like me to quote Biblical STUFF, because he knew nothing about the Bible, and professed to be a Gnostic Priest of some kind. The Wilsons were real MEN OF GOD, who spoke God’s Words to real royalty, who were married in St. George’s Chapel, thus their real DNA was spliced together – by God’s Words! We will be hearing much about God’s Words in the fight over Legal Abortion. There is that – A WORD! There is another A word that applies…….ALIEN. To put THE WORD of God in the ears of the Children of God, is still a scared responsibility that no one should take lightly. Dan Brown came out with his Da Vinci Code after the Sinclair’s and I had our row. I exchanged e-mails with Jimmy Dale Rosamond who is conducting the Rosamond DNA study, and who has strung together so many Roses! Jimmy is a straight shooter, and thus I have never brought his name into the Blood Feud – until now! WE are grounded in what is real. How many Royal People stood on the brass images of Wilson and his wife? How many royal shoes have worn down these images of a real man, and his real wife? Under this stone lies the bones, and the DNA of a Man of God, who knew this name ‘The Rose of Sharon’………..and thus the codex is………….ROMAN. There is a rose on the box and five wheels. Roman of the Rose! As to forgiving Ian Sinclair?………To hell freezes over! He had a bagpipe player backing him up, and, I had none! How fair is that? This is why I have Victoria Bond blowing on her pipes to her hearts content. I and Ian Fleming are in the same Rosy Tree, that is full of Hollywood Stars, as you shall see. Elizabeth Rosemond Taylor was suggested for the role of Bonnie Butler. Folks still see her as the real Scarlet. God loves a good Love Story! This is why we see William Wilson’s wife next to him. Did he secret her bones into a Catherdral named after the Gallant St. George? It might be of great value to take a peek. Are we looking at another candidate for the true Shakespeare who is in Elizabeth Rosemond Taylor’s rosy tree? After hearing the voice of their Creator in Eden, there was a Abolishment, a Abandonment, a Atonement. Then came the sweet whisper of love in loving ears. Here is the blood of life. There is the Lover’s Prayer, that they may be forgiven and returned to Paradise. Although earlier Webb information is available, we will start the Webb story in the late 1400s in villages near Stratford, Warwickshire, England. If Stratford sounds familiar, it’s because of William Shakespeare. He was born in Stratford-Upon-Avon and that’s the same town. In fact, there are some very interesting family connections between the Webbs and the Shakespeares. The picture below is the birthplace of William Shakespeare. His grandmother was named Abigail Webb, and she is an ancestor of the American Webbs. This site provides an authoritative replication of the Shakespeare family tree from John Shakespeare to more recent times. While personal genealogy searches (like Ancestry.com) have done wonders to spur interest in family genealogies, there has also been a proliferation of errors (for an amusing account). This site helps correct these errors and provide a reference for those interested in the Shakespeare Genealogy. First, there are no direct living descendants of William Shakespeare. Thanks to bubonic plague, other maladies, and a general lack of getting it on, all of William Shakespeare’s descendants died out within two generations. BUT…thanks to his sister Joan, his nieces and nephews live on today. Amazingly, with eight children including William, only Joan had descendants that made it past a few generations. So the closest you can come to William Shakespeare is your great uncle, although you can be a direct living descendant of William’s dad (John Shakespeare) through Joan. Since Joan Shakespeare married William Hart, that paradoxically means people today with the last name Shakespeare are no more likelier related to William Shakespeare as pretty much any other name out there. The most likely surname that has a direct connection to John Shakespeare (and can claim William as a great uncle) is Hart. Each generation, enough male Hart’s were born to continue that connection to today. Of course, nearly half those also were were female Harts who took the name of others in marriage. Some of these other surnames you can see in the tree below such as Smith (e.g. Mart Hart married William Smith), Bradley, Whitehead, Grubb, Ashley, Watkins, etc. It’s also clear in the tree that many of Joan’s descendants were aware of their connection to their famous uncle and named their children William Shakespeare, using Shakespeare as a middle name. As mentioned above, Ancestry.com while good to spur interest is also replete with errors. It’s difficult to go back centuries and trace ancestries. But luckily if you end up being famous, someone else might take on that task for you. In this case, George Russel French produced the text “Shakespeareana Genealogica” in 1869 (available on Amazon!). French first published detailed ancestries of Queen Victoria and King Edward I before deciding to move onto the Shakespeare and Arden families, with tables of descent. This contains the family tree through the early 1800s. This is truly a gold-mine for the Shakespeare Genealogy as it covers the hardest part in any genealogy search: linking centuries ago when records were crude to a more modern time. It’s difficult for anyone to reach back centuries without investing a lot of time in archives but typically, going back to the 1800s is achievable often by asking grandparents what they remember and who their grandparents were. This is likely what Veldron Matheson did in 1980 with “Our Shakespearean heritage: the Shakespeare-Hart-Ashley family.” This takes off from French and fills forward until the mid-1900s with an emphasis on the Hart and Ashley families. The book contains a family tree linking back to John Shakespeare as well as pictures of the Hart family members today. So, without further ado, a detailed Shakespeare Family tree is presented below based on French (1869) and Matheson (1980). The resolution is high enough for anyone to be able to read the names, dates, and any extra information. It brings the bard far enough into the present so that anyone interested in tracing (and maybe linking) their genealogy to it should be able to reliably discover this link.